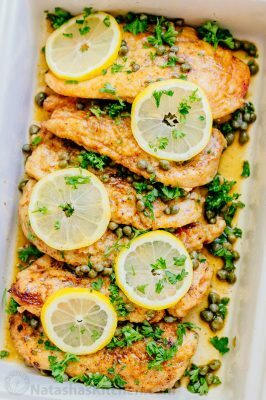 Chicken piccata sounds fancy but it's really a very simple recipe. The chicken is seasoned, dredged in flour and sauteed then drizzled with an easy lemon sauce adds incredible flavor. Cut chicken breasts in half lengthwise so you end up with 6 cutlets. Sprinkle both sides of cutlets with salt and pepper. Add 1/2 cup flour to a shallow dish. Dredge chicken to coat with flour, shaking off the excess. Transfer to a large plate in a single layer. Place a large skillet (non-stick or stainless steel will work) over medium/high heat. Add 2 Tbsp olive oil and 2 Tbsp butter. Once butter melts and begins to sizzle, add 3 pieces of dredged chicken and saute 2-4 minutes per side (depending on thickness of chicken). Remove to a serving platter, add additional 1 Tbsp oil and 1 Tbsp butter and sauté remaining chicken. In the same skillet without reducing heat, add 1/2 cup wine, 1 Tbsp butter, 1/4 cup lemon juice, and 1/4 cup rinsed capers. Simmer 1 minute then dip your chicken pieces into your sauce a few pieces at a time and place them back on your platter. Continue simmering sauce another 2 minutes to slightly thicken. Drizzle sauce over chicken and garnish with lemon slices and fresh parsley.